The National Weather Service (NWS) in Eureka, Ca has introduced a new product this fall that could be of interest to you. This product is called the Beach Hazards Statement (BHS). The purpose for the BHS is to alert beachgoers of unique coastal hazards that may not meet NWS Watch, Warning, or Advisory criteria or be sufficiently addressed in other NWS provided products. These unique hazards include unusual wave conditions, dangerous currents in the surf zone, and hazardous weather phenomena near the beach (e.g. lightning). Although these hazards are not uncommon along the northwest California coast, the BHS will primarily be issued for sneaker wave threats. Sneaker waves are larger than normal waves that can catch beachgoers off guard and potentially wash them into the frigid and turbulent ocean waters. Sneaker waves are dangerous because they are deceiving. During high risk sneaker wave days the ocean will appear calm and inviting due to destructive interference where wave systems cancel each other out. 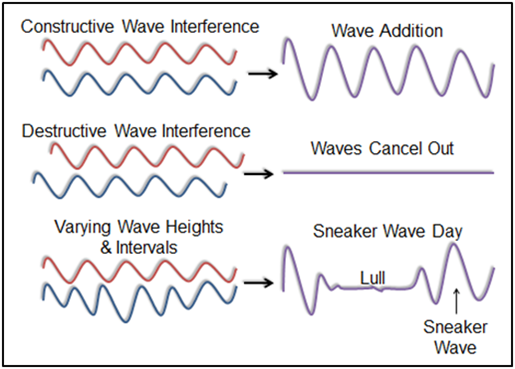 Sneaker waves form when similar wave systems combine through constructive interference resulting in a larger than normal wave. The long lulls of smaller wave activity can last as long as 30 minutes before a large set of waves arrive (see Figure 1). This explains why surfers watch the ocean for long periods of time, so they can see where the best waves are breaking when the larger sets come in. 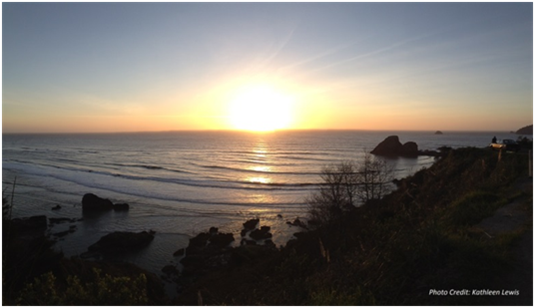 Although they can be good for surfing, sneaker waves pose a serious threat to mariners in or near the surf zone. Anglers fishing off the jetty for lingcod or on the beach for surfperch are especially at risk due to their close proximity to the water. Crossing the bar also becomes hazardous for boats as sneaker waves can cause waves to break in the channel, especially during strong ebb currents. Sneaker waves become less of a threat in deeper waters; however, shoaling is possible beyond the normal surf zone over sand bars and rock reefs. If there is a sneaker wave threat, the BHS will be colored turquoise on the hazards map on the Eureka Weather homepage. We will also send out sneaker wave information on Facebook and Twitter but the BHS will be the best place to look for details. Stay safe on the coast this fall by staying informed. Always check the forecast and observations before venturing out whether it’s to the beach, in the surf, or out in the ocean.